The monsoon is here and when it really pours, umbrellas just don’t cut the deal. Save yourself from the drenched-cat look and get these funky raincoats to step up your style. Who said raincoats spoil your style? Especially when they are transparent and come in with funky piping. Add a dash of colour to the gloom of rain clouds with this transparent raincoat that comes in with rainbow coloured piping, bright colourful buttons and chunky out pockets. Check this one out here. Old bulky cuts and scary coloured raincoats are a story from the past. 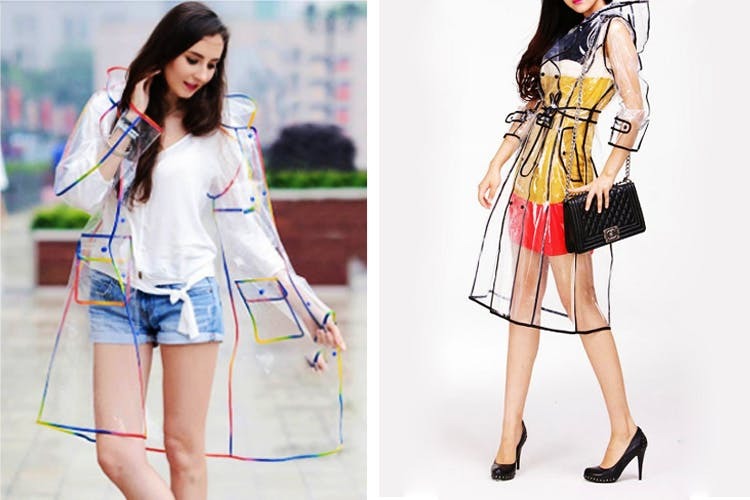 This monsoon amp up your style with this transparent raincoat cut and styled like a trenchcoat. Check it out here. If a full-on trench raincoat makes you feel clumsy, then pick a trench jacket. With zippered hand pockets, hood and a stylish tie-up detail, this Columbia trench jacket is perfect to team up with shorts, denims or tights. Click here to check it out. None of those boring browns or greys, this one is in perky pink and comes dotted with white polka dots. Can it get cuter than this? With toggle drawstring to adjust the hood and outer pockets, this one is a perfect example of utilitarian style. Check it out here. Are you the sort who likes a good camouflage print? Then this one is definitely for you. Styled like a poncho with buttons zipping up your sides, this one comes in a camouflage yellow print and is easy to slip in. It comes with an adjustable hood, and can easily be folded into a compact size. Click here to check it out.